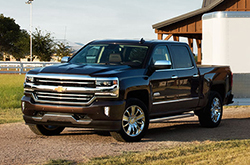 The exquisitely redesigned 2016 Chevy Silverado is a welcomed addition to Chevy's lineup. Featuring an all-new exterior design, the full-size pickup appears to be much more aggressive and sports a variety of new styling elements that reflect its overall strength. From freshly sculpted body panels to new headlights, the Silverado displays a wide array of updated features. A series of mechanical and technology upgrades also increase the truck's appeal and put it on par with other models in the full-size pickup segment. For more information about the truck and its enhancements, read our 2016 Chevy Silverado review below. 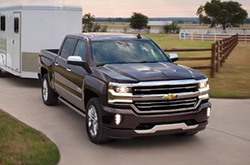 With the release of the all-new Colorado midsize pickup in 2015, Chevy felt it was only right to redesign its big brother, the Silverado, for the 2016 model year. To give it a mid-cycle refresh, the brand decided to completely change the pickup's exterior design and bring it into the modern age. Revised from the ground up, the 2016 Chevy Silverado in Springfield arrives with a chiseled body, sculpted hood, fresh front end designs and all-new dramatic lighting. Chevy even did away with its signature dual-stacked headlights, giving it smaller, engaging headlamps. Higher-end models receive two rows of LED lights separated by an accent bar. In an effort to better suit drivers, the 2016 Chevy Silverado in Springfield includes expanded use of its eight-speed automatic transmissions. The pickup's Chevy MyLink infotainment system has also been updated to support Apple CarPlay and Android Auto across the model lineup. New to the auto industry, each of these innovative systems allow drivers to access apps on their smartphone through the car's infotainment system, which helps reduce distracted driving. With a fresh look and collection of new offerings, the Silverado is a solid workhorse for truck buyers. Keep reading our 2016 Chevy Silverado review to discover additional details about the model and spec information. 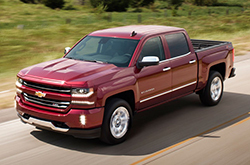 Compare Chevrolet's newest model of the Silverado to its rivals and we're positive that you'll choose it over vehicles like the 2016 GMC Sierra 1500, Toyota Tundra, Ford F-150, Dodge Ram and the Nissan Titan. MO shoppers will benefit from the Silverado's leading-edge features and inexpensive sticker price. It's a spectacular value. Just compare its price to the vehicles in its class and you'll surely see why so many Springfield drivers love it. Find even more details about its vehicle specs; see our quick-facts list for the Silverado - bullets below this paragraph. To make your car search less of a hassle, Reliable Chevrolet is happy to offer research tools like the 2016 Silverado review above, as well as reviews of prior models. With the help of experienced automotive writers, we have written some of the best reviews about Chevrolet's models that you'll find online. Every section comes jammed with helpful data, specs and research - just what you need to make sound decisions about your next Chevrolet purchase. Find out more about Reliable Chevrolet's amazing lineup! Review and compare Chevrolets other vehicles in our digital research index now!